Despite all of the growing temptations we have at home, we are travelling more. Flights are getting cheaper, hotels more plentiful and far flung places ever more reachable. If you want to understand how this new economy works and the impact it has on you as a consumer you have to look beyond the 5-star ratings and see the psychology at work. Airline and hotel booking websites use this technique extensively. When you’re browsing for flights, you’ll usually be notified that there are a limited number of seats left available at the price you have selected. If you’re thinking you might be able to find a cheaper flight elsewhere this acts as a powerful nudge to commit. The airline is cleverly playing on your fear of loss hoping you go ahead and secure the seat or else lose it at that price. Why is a £1,000 handbag more desirable than a very similar looking £50 handbag? Why does a meal that cost £300 taste better than one that cost £25? The answer lies deep in our primitive brains. When looking at two hotels that offer exactly the same facilities in the same location, you are going to assume that the one that costs more will be the better one somehow. A higher price will normally boost demand by playing on the assumptions being made in the consumers mind. Quite often, the higher priced service or product has no discernible advantage over the cheaper alternative. It is merely the fact that it is more expensive we attach extra value to it, which in turn influences our choices. We are social creatures. The thoughts and opinions of others matter a great deal even when they’re not directly related to us. This is why online reviews are so powerful. We all do it: find a decent looking hotel within our budget and the first thing we look to is the reviews. Why is this? We are mostly ‘satisficers’; that is to say we are happy for our basic criteria to be met and then confirmed to us by others. We don’t want to spend hours and hours searching for the best possible hotel at the best possible price. When you see ‘Most Popular’ on a listing, it’s been proven that the tag will have boosted bookings by a factor of 2.5. Surprisingly, when asked if other people’s opinions have any influence on consumers choices they so ‘no’. Studies have shown time and again that we are deluding ourselves and that social proof is very much having an effect. Imagine: you’re strolling down the beach at sunset, it’s a hot day and you’re thirsty. You spot 2 cafés. One is selling a cold Coke for $8 and the other café is selling the same Coke for $5. Bargain you think, and gladly hand over your $5. Well, not quite. It’s only a bargain when compared to the same $8 bottle next door. Everyone knows that a Coke would usually cost at most $2 but because the initial price anchor was so much higher it looks cheap in comparison. This is known as price relativity. This type of framing happens everywhere you look: airlines purposefully inflate certain tickets to make others look better value, hotels will have expensive rooms that are almost never booked out so their standard rooms feel like a snip. This price relativity is at work when you’re using cash abroad too. If for example, it’s your first day in Japan and you spot a McDonald's Big Mac that cost 680 Yen, you’re likely to be unnerved at first. This is because your normal monetary anchor is far lower for a humble McDonald's, even though we consciously know it’s in a completely different currency. Prepaid currency debit cards are becoming more popular with travellers as a more secure and easier way of managing your money abroad. The advantage of simply tapping your card on a machine when paying for stuff makes it seem like a breeze when compared to fumbling around with unfamiliar notes and coins. However, this can lead to higher spending than you would if you only dealt with cash. 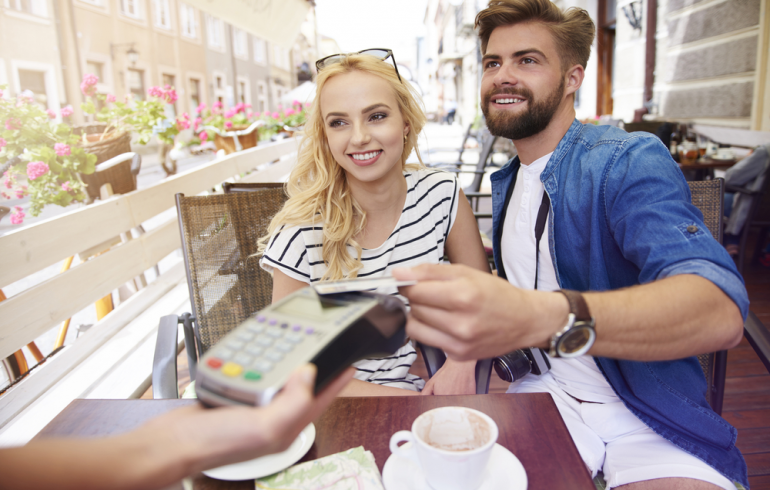 Our minds don’t register the spend in the same way as we would when handing over a 50 euro note compared to tapping for the same amount with a card. The psychological pain is reduced because we can’t see or physically feel the cash.